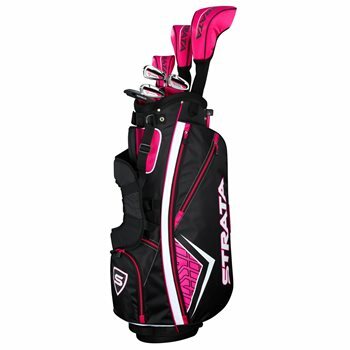 The Callaway Strata club set gives golfers everything they need to hit the course. These clubs are designed to create maximum performance right out of the box for more confidence from tee-to-green. The set features a lightweight 460cc forged driver with a large sweet spot and titanium head to provide more forgiveness, a forgiving over-sized fairway wood with a more aerodynamic head shape for long, high flying shots, and a hybrid to provide more confidence on a variety of shots. The stainless steel irons offer forgiveness and control and the mallet putter with alignment provides incredible accuracy. The lightweight and durable stand bag comes with five convenient pockets, an additional cooler pocket, a rain hood and a backpack strap system.